Inspecting the packaging of Warner Archive Collection’s first release of Popeye shorts on Blu-ray there is a notice that says the disc is intended for the “Adult Collector and May Not be Suitable for Children.” That must mean today’s children, because the cartoons of my youth were this, Tom & Jerry, and Looney Tunes, characters whose lineage predates my own by decades. Now some of the shorts were politically incorrect. I didn’t know that at the time. I didn’t even know what politically incorrect meant. I was a kid. POPEYE THE SAILOR cartoons were part of TOM & JERRY AND FRIENDS, which aired on TBS in the mid-to-late 1980s. The show was my introduction to the one-eyed sailor with a pipe in his mouth and anchors tattooed on his massive forearms. Popeye downed cans of spinach like they were chewing tobacco and boosted sales of the canned vegetable in the process. If you were a kid and wanted to be big and strong you ate spinach. I can attest, though as a little boy the taste was most disagreeable. Most shorts involved the love triangle of Popeye and shipmate/friend/villain Bluto vying for the affections of Olive Oyl. Bluto would demonstrate his dominance by clobbering Popeye until Ol’ One Eye ate his spinach, giving him superhuman strength. From there the sailor hulks up and defeats Bluto with relative ease. Pretty simple premise, and yet audiences couldn’t get enough. They made over 200 animated shorts between 1942 and 1957. Popeye’s popularity was undeniable, nearly overtaking Mickey Mouse at one point. He was the precursor to the superheroes that dominated US comics. (The original Popeye comic strip debuted nearly a decade before Superman made his first appearance in Action Comics #1.) His likeness was used to sell everything from lunchboxes to war stamps. Popeye was even a 1980 live-action film starring Robin Williams and Shelley Duvall. Well blow me down – all this history and we’re just now getting the Technicolor seasons of Popeye shorts on home video. The last release was 2008, chronicling the period right after Paramount severed ties with famed animator Max Fleischer and his brother Dave (1941-1942 and 1942-1943). 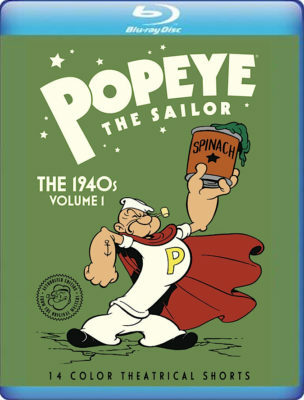 POPEYE THE SAILOR: The 1940s, VOLUME ONE presents the theatrical shorts, from 1943-44 and 1944-45, in their entirety. No extra bells and whistles. Just fourteen complete, uncut shorts, transferred from the original Technicolor negatives. The gang is all here: The love triangle, plus Popeye’s shipmate pal Shorty and his misbehaving nephews Pipeye, Poopeye, Peepeye, and Pupeye. Some of the highlights: SPINACH PACKIN’ POPEYE is a compilation short that reuses two Fleischer specials that were done in color; for SHE-SICK SAILORS Olive Oyl pines for a guy like the one in her comic books (Superman); POP-PIE A LA MODE was banned for American television because of its depiction of African natives; and FOR BETTER OR NURSE is the only time I can recall Popeye feeding Bluto spinach for the purpose of being pummeled. POPEYE THE SAILOR: The 1940s, VOLUME ONE is a must for fans of animation. Warner Bros. has done a spectacular job in restoring these shorts, with only a few blemishes that were unable to be fixed completely. Say what you will about racial stereotypes and political correctness, good, bad, or indifferent, this is a piece of history, and without consumer support we may not get the remaining hundred-or-so shorts. POPEYE THE SAILOR: THE 1940s, VOLUME 1 is now available for purchase through wbshop.com.